You are curenlty in Convatec Aloe Vesta® Protective Ointment 8 Oz made by Convatec and asigned to category. the Petrolatum-Based Ointment Is Easy To Apply. It Provides An Effective Barrier That Seals Out Moisture, Contains Emollients To Moisturize And Is Non-Sensitizing And Fragrance Free. Soothes Red, Sore Or Irritated Skin From Urine Burns, Diaper Rash, Feces And Other Irritants. Provides Protection As A Moisture Barrier. Conditions The Skin While Repelling Moisture. Most Useful In Areas Of The Body That Are Frequently Exposed To Moisture. Suitable For Common Sites Of Maceration, Including Perineal Skin, Breast/skin Folds, Skin Surrounding Wound Sites, Skin Surrounding Tube Or Drain Sites, And Between The Toes. 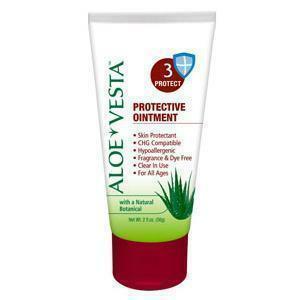 You have selected Convatec Aloe Vesta® Protective Ointment 8 Oz from Skin Care. We hope that this Convatec Aloe Vesta® Protective Ointment 8 Oz made by Convatec is what you were looking for. If you have any questions about this particular Convatec Aloe Vesta® Protective Ointment 8 Oz or any other products from Skin Care, please call us. We have an experienced staff that will gladly help pick out the correct Convatec Aloe Vesta® Protective Ointment 8 Oz for you, also. If you are looking to make a purchase of Convatec Aloe Vesta® Protective Ointment 8 Oz in large quantity or you are a Hospital or Medical facility and need help on making a purchase of Convatec Aloe Vesta® Protective Ointment 8 Oz made by Convatec, please contact us.